I want to understand the adjustment process from Very short run production decision to Short run production decision to Long run production decision. As far as I've understood: consider an increase in demand due increase in money supply. This shifts AD curve to the right. Now in the very short run firms are willing to supply whatever demanded at the same price (I want to know why. They'll ask workers to work overtime so they'll have to pay extra wages so why would they not charge higher price instantly?) After the very short run, prices rise(why?) and demand falls so output goes down after the initial increment. In the long run, prices keep rising (why?) and output finally comes back to initial full employment level. I couldn't find proper coherent explanation of this process in mankiw or in dornbusch or in Able and Bernanke. In the very short run, the AS curve is perfectly price-elastic (i.e. on the diagram, it is a horizontal line). It is also referred to as the Keynesian range. In this time period, firms respond to a rise in demand for their product without considering the effects of the rising demand, such as higher prices. This can be generalised for most firms, but not all. We can look at the example of a book shop or a food stall. It is highly unlikely for these business owners to revise their prices on daily basis based on their past sales records. Prices are more likely reviewed on a yearly basis, or at some longer time intervals. Regular price revision could complicate simple business accounting and may also dispel customers, especially if your price revisions keep increasing the price. There are some firms that are able to change prices based on instantaneous demand. These would include the ride-hailing service providers, such as Uber and Grab. Their computer algorithms are programmed to respond their market conditions of the moment and price according to the level of demand at that instant. Firms that are able to do this are more of an exception rather than the norm. Another way to view it would be from the resource employment viewpoint. In this time period, the real national output/income is much lower than the full employment level. Thus, there is an abundance of un-utilised or under-utilised resources. Should there be an increase in aggregate demand, the spare capacity will allow producers to increase output production easily without incurring high costs. Hence, there is no pressure on the general price level to increase. In the long run, prices do not keep rising. The AS curve is simply perfectly price-inelastic (i.e. on the diagram, it is a vertical line). This is also called the classical range of the AS curve. In the LR, all firms in the economy reach their full employment level (i.e. resources have been fully-utilised to their maximum capacity) and there is no demand-deficient unemployment. Price levels are fully flexible as all firms will make adjustments to their prices in response to changes in demand. This is what the vertical line indicates, not what you have mentioned. The model I have learnt for the AS curve is a hybrid model, which is also depicted by the Wiki page for AS. The "short run" here essentially corresponds to your so-called "very short run". The "long run" here is the same as yours. Not the answer you're looking for? Browse other questions tagged macroeconomics supply-and-demand keynesian-economics aggregate-production classical-economics or ask your own question. Why do firm output decreases when fixed cost decreases in Long Run? Why does quantity supplied increase with price in economics? 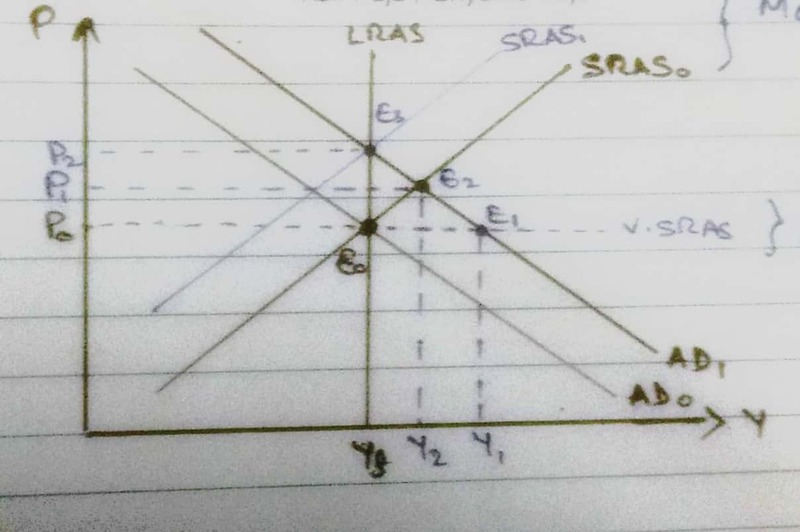 Why are the concepts of short-run and long-run equilibrium exclusive to aggregate supply and demand and macroeconomics? What happens if an expensive thing goes into high supply for a limited time?